Which sentence contains an infinitive phrase? What is an infinitive phrase? First, it’s important to understand what an infinitive is. An infinitive is a verb form that typically begins with the word “to”. An infinitive phrase includes the infinitive, plus any modifiers and complements. They can function as nouns, adjectives, or adverbs in a sentence. This printable worksheet asks students to read through the given sentences and circle the number of each sentence that contains an infinitive phrase. 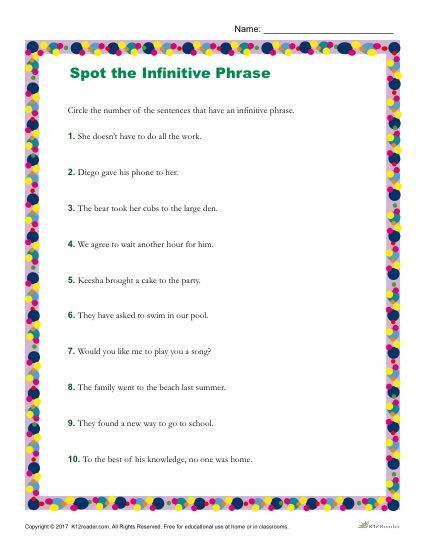 This infinitive phrase worksheet is great practice for 4th – 6th grade students working on improving reading and writing skills. To download and print the worksheet PDF, click the link below.